There are many benefits in choosing to make a lifestyle change. For us, traveling full-time has given us time to reflect on things that matter most to us. Every day there is something to get frustrated about in the world (especially if you turn on the news), but living more consciously now (with both thoughts and choices) definitely, impacts what we buy, consume and appreciate in our products. Our purchase goals in our new life of conscious living and long-term travel are: anything we buy has to be built to last because we have limited access to shopping, and we choose to shop less by buying great products. What is more important to us now is finding products that are doing something responsible and purposeful to help the world in some way. After all, we need all the help we can get these days to make the world a better place to live in. And we found an excellent product that does just that. According to the World Health Organization, over a billion people do not have access to eye care and close to 80% of the world’s blindness is preventable. We are lucky to have a privileged lifestyle, where vision isn’t an issue. Although sunglasses are certainly a benefit to eye protection, it is only a small expense and just a fashion statement in the whole scheme of things. 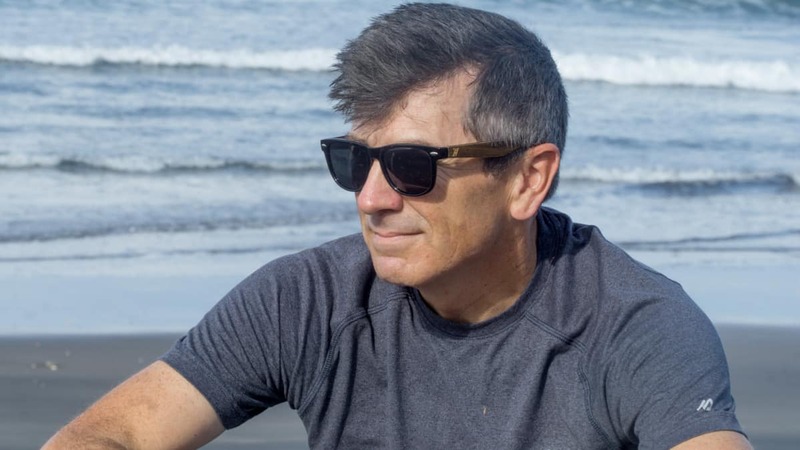 Thus, it doesn’t take much convincing for us to recommend a great Bamboo Sunglasses brand to readers like you. 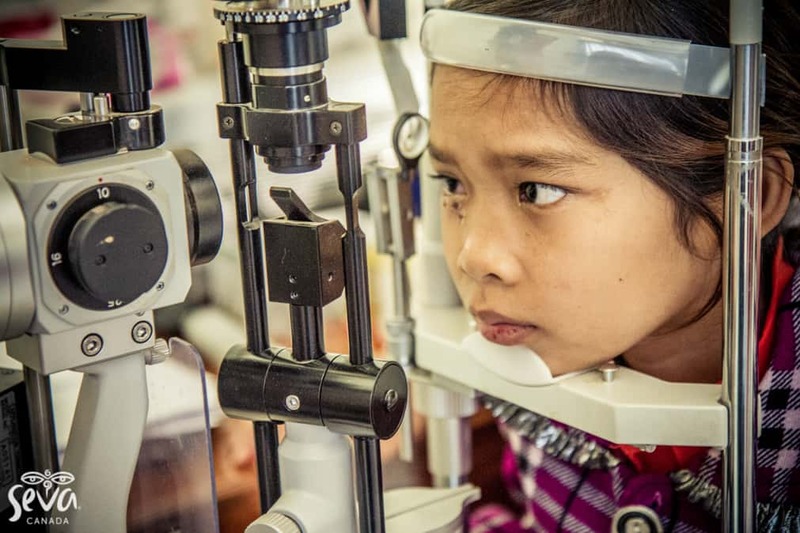 A young girl in Cambodia having her eyes tested. 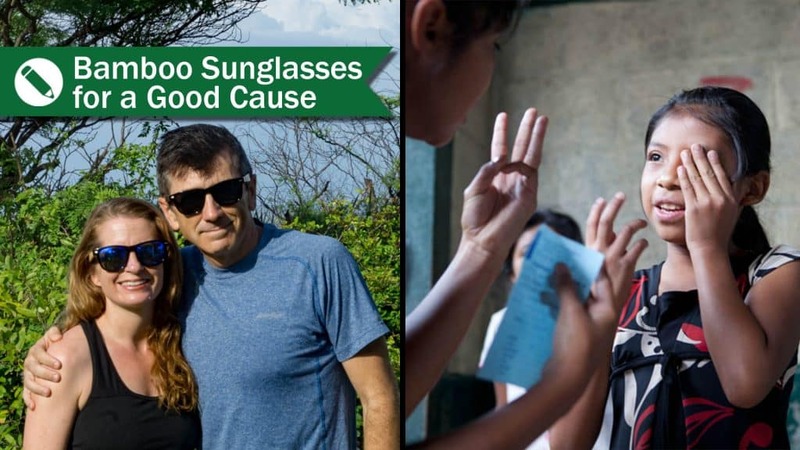 Amevie is a Bamboo Sunglasses brand where every pair purchased gives back a pair of prescription eyeglasses to a child in need. These proceeds go to benefit Seva Canada – a non-profit organization which focuses on community-driven projects to reach many underserved people through life changing eye-care services. 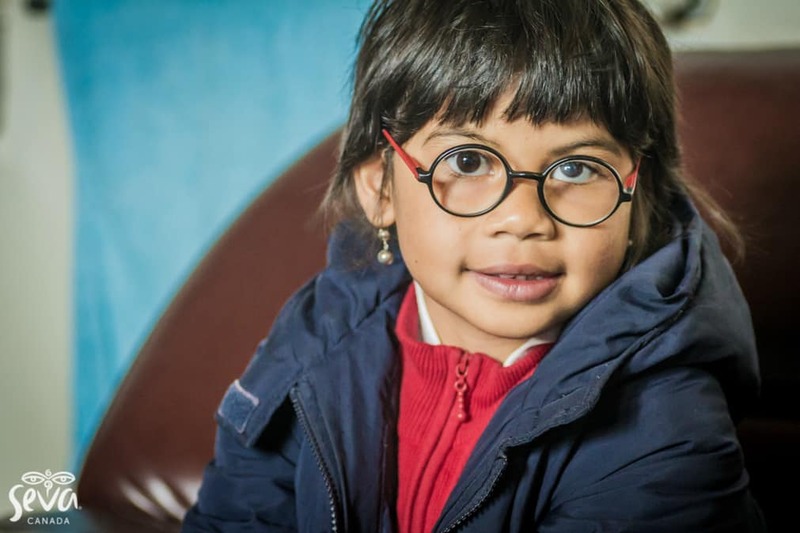 Malagasy girl with her new glasses. We met with the owner of Amevie, Ana, in Toronto . She explained her desire to work with Seva Canada was born out of her mother’s experience with regards to her diagnosis with severe cataracts, wherein she nearly went blind. This is despite having the privilege of top quality and free healthcare in Canada to regain her sight, unlike many others that do not have the opportunity for this kind of healthcare access. 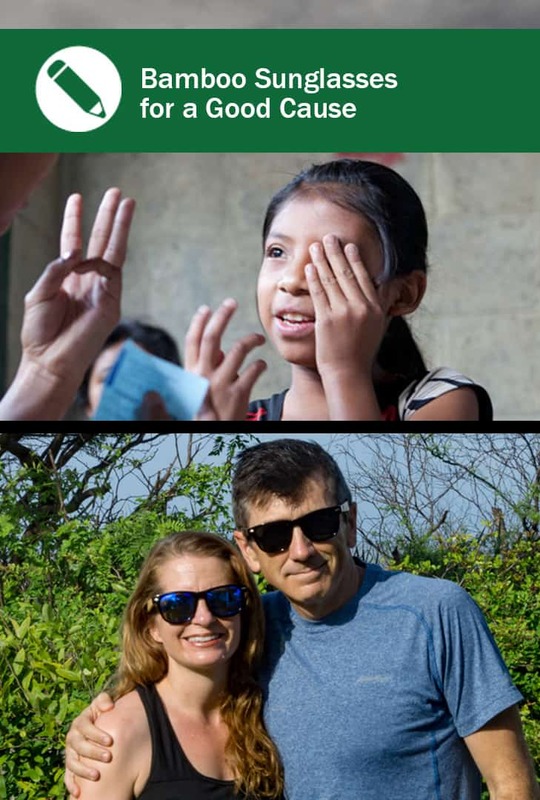 Seva was the perfect partner to give back directly to the community that needs eye-care assistance through the Amevie sunglasses. Amevie delivers on the quality product we were looking for. Our sunglasses frames are light-weight, made of waterproof bamboo, top-notch hinges with exceptionally high-quality polarized CAT 3 lenses that block 100% UV rays. I’m wearing the Bamboo Wayfarer Sunglasses with the Laguna blue tinted lenses. I love this pair because they are the best-polarized lenses I have owned. In addition, they are durable and have held up as we travel from country to country putting on and taking off our sunglasses often. I also like the folding case that is easy to fit in my purse and the microfiber pouch that cleans the smudges quickly when I’m on the go. 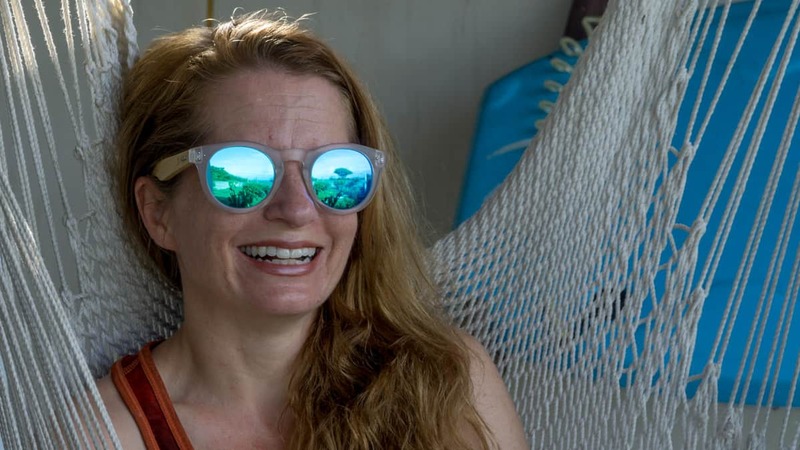 I also have a pair of the Del Mar Bamboo Sunglasses – with the same features but a rounded shaped frame that fits differently for the size of my face. Troy is wearing the Bamboo Wayfarer Glasses with the Laguna Black-tinted lenses. These remind us of the classic Ray-Ban shaped frames. He loves the clarity of the polarized lenses, as well as the look and weight of the Bamboo wood. 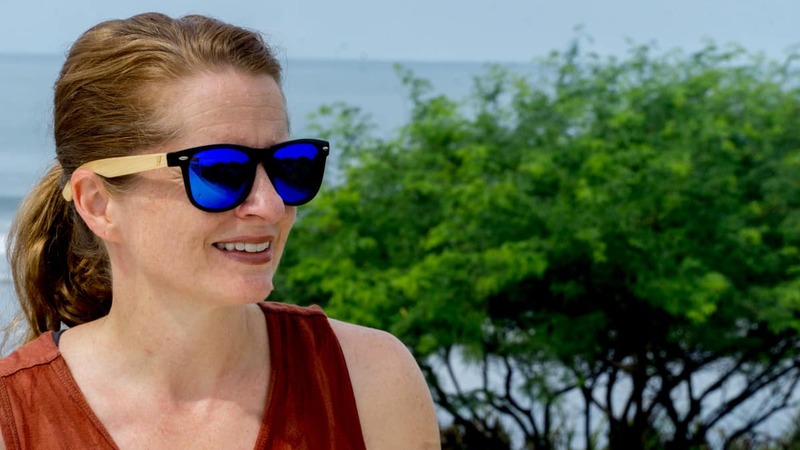 We wear our Bamboo sunglasses anywhere, whether it’s a night out in town, or a running and sports activity, or for casual days, and most especially when traveling. We’ve been wearing them throughout our travels in Nicaragua in sun, showers, overcast skies, and brisk Pacific Ocean winds. For more product reviews you can find them here. We received complimentary sunglasses for this review, as always we recommend only products we like and use. This helps us keep providing quality content and tips for you. Thanks for your support and we hope you have peace of mind with this great product!